It was a beautiful Tuesday morning on December 29th, 2015. Mr. Steven Creech was fishing aboard the charter boat New Latitude out of Fort Lauderdale, Florida. While fishing the waters just offshore, Mr. Creech hooked up with a nice Atlantic Sailfish (Istiophorus platypterus). After a 15-minute fight, they brought the Sailfish alongside the boat to tag it. The Sailfish was named Pierre (Tag ID: GFR3303) had a total length measured at of 84 inches (213.36 cm) at the time of release. That Sailfish was recaptured an incredible 335 days later on November 27th, 2016 by angler Harry Akers while fishing aboard the sportfisher Princess Lily. The recapture was just offshore of Juno Beach, Florida, approximately 44 miles (70.8 km) north from the original tag location. 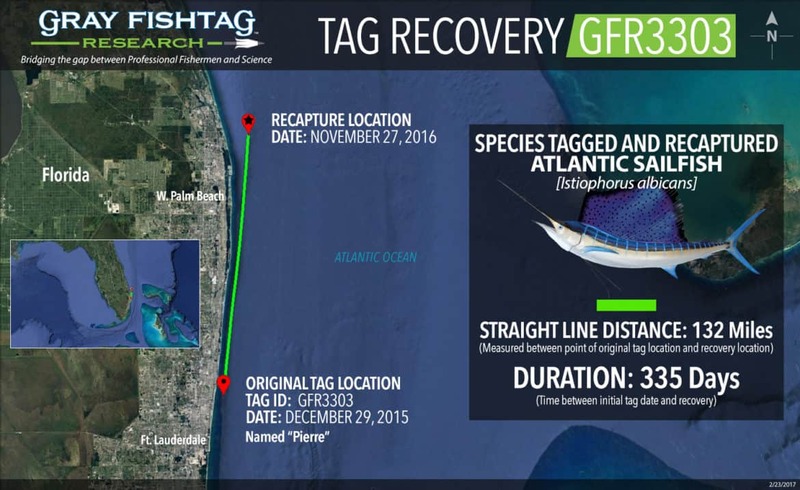 The Sailfish tag recovery was reported to Gray FishTag Research by seasoned fisherman, Robert “Fly” Navarro. At the time of recapture, the Sailfish had an estimated total length of 87 inches (220.98 cm). Based on the length measurements, this Sailfish was a mature fish. After the tag information was recorded, the Sailfish was retagged and subsequently released healthy and unharmed. Atlantic Sailfish is one of the most popular fish targeted by recreational anglers. They are found worldwide in waters between approximately 40° N and 40° S latitude. Sailfish exhibit a dark blue color with white and brown spots along the ventral side of the body. There are also approximately 20 vertical running light blue bars. The body color can vary depending on the level of fish excitement. Sailfish is one of the smaller members of the Istiophoridae family and the most coastal of all the billfish species. The coastal waters around the continental shelf edge is ideal habitat with an abundance prey items (pilchards, sardines, small mackerels, etc.). Interesting Fact: Sailfish in the Pacific Ocean tend to grow larger than Sailfish found in other bodies of water. Also, similar to other billfish species, Sailfish exhibit sexual dimorphism, meaning that females grow larger than males. The New Latitude charter boat crew will receive Gray FishTag gear for their tagging efforts. The tag recovery angler, Mr. Harry Akers, will receive a pair of Costa Del Mar sunglasses, a Tag & Recovery Certificate, and Gray FishTag gear for catching the tagged Sailfish.